No matter what the occasion, most cakes can be made to suit the number of guest you have. 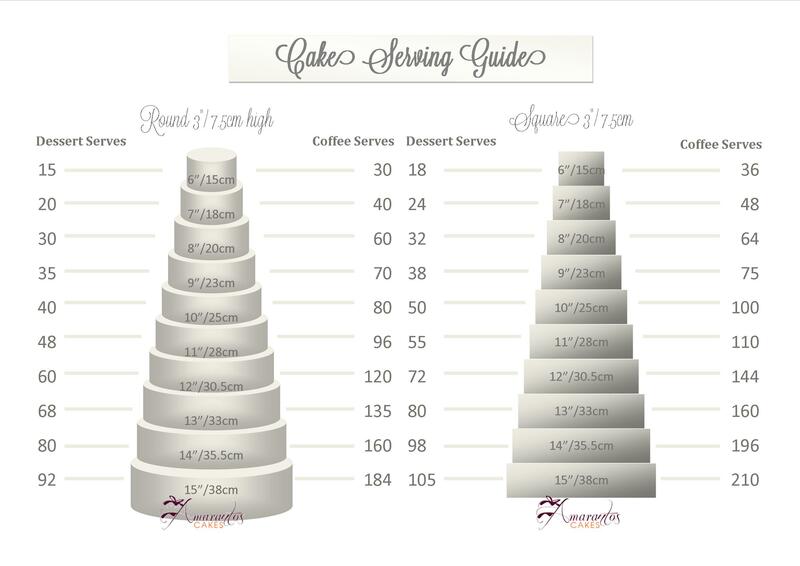 The size of the cake will depend on the number of people you need it to serve, if the cake can not be made larger or if you wish to keep the cost down, a cutting cake for the kitchen can be made to supplement the number of servings required. These pictures are a guide as to how to cut your cake. 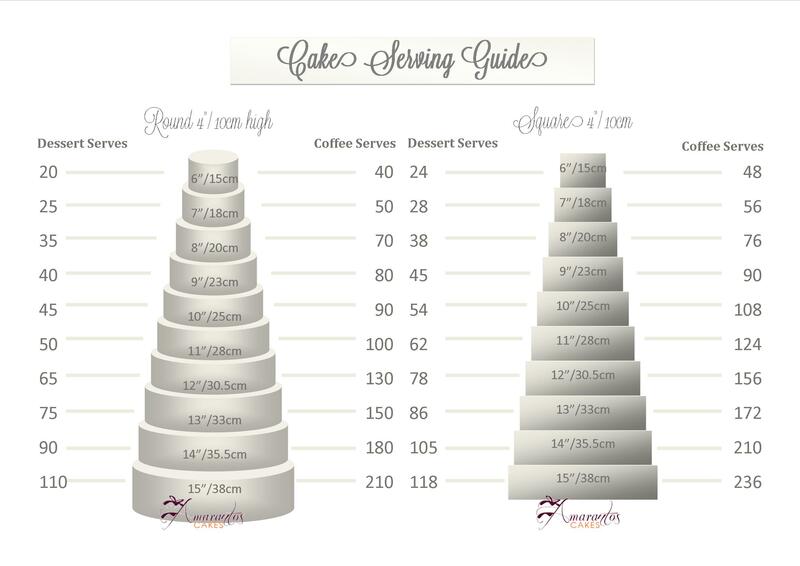 The first step is to separate any tiered cakes and to remove any decorations on top of the cake. When slicing your cake it helps to keep the knife in a jug of hot water and clean between slices. Start by cutting an inner circle either 1″ or 2″(depending on desired serving size) from the edge of the cake and slice this into 1″ pieces. Cut another inner circle which you will slice into 1″ pieces again and continue this until you have cut the entire cake. Start at one end of the cake and slice 1″ or 2″ thick strips ( depending on desired serving size), then cut strips into 1″ pieces. Continue until you have cut the entire cake. Decorated cakes must be stored at room temperature away from sunlight. In the instance of high humidity, cakes should be stored in a refrigerated air-conditioned room (evaporative cooling increases humidity). Can remain at room temperature for up to 4 hours. Refrigeration required at 3-5 degrees Celsius. Remove all sugar decorations such as flowers, figures ribbons etc. If you don’t think you will consume the entire leftovers in one instance then we suggest cutting the leftover cake into smaller portions. Wrap each piece tightly with plastic food wrap and place in a ziplock bag and freeze. To thaw, simply remove from the freezer and thaw in the refrigerator overnight. Remove from the fridge the next day and remove all wrapping and allow the cake to come to room temperature. Note – the icing on the cake will most definitely absorb the moisture from the freezing process and loose its smooth texture, this is normal. Storage of Sugar flower/figures, etc. Decorations are not to be consumed and should be removed prior to serving. You can store these in an airtight container, away from sunlight, humidity and heat. Over time the colors will fade. Remember that decorations on cakes and icing are fragile so always handle your cake with care. To remove sugared decorations always use a sharp knife to pry them gently off the cake. When transporting we recommend placing the cake on a flat surface with a non-slip mat underneath. In hot weather you will need to keep the air-conditioning on at all times and away from direct sunlight, especially with cakes with coloured icing (as this will fade the colour). Always drive with care avoiding sudden breaking or stopping. Ensure when moving cakes you keep them level, tilting a cake in any manner can cause cakes or decorations to move, topple or break. We can not be responsible if the cake is damaged in transit whilst in your care. Once a cake has left our premises it is your responsibility to treat the cake with due care and diligence. In the event that you damage the cake after it has left our premises, we can in most cases repair it if not to its original state as close as possible depending on the damage. Please contact us immediately if this occurs, take photos of the damage and forward these to us so that we can assess the damage. There are several options for repairing your cake, you can return the cake to us and we can repair it at a cost of $30 per half hour or we can come to you with a call out fee of $100 plus $30 per half hour.